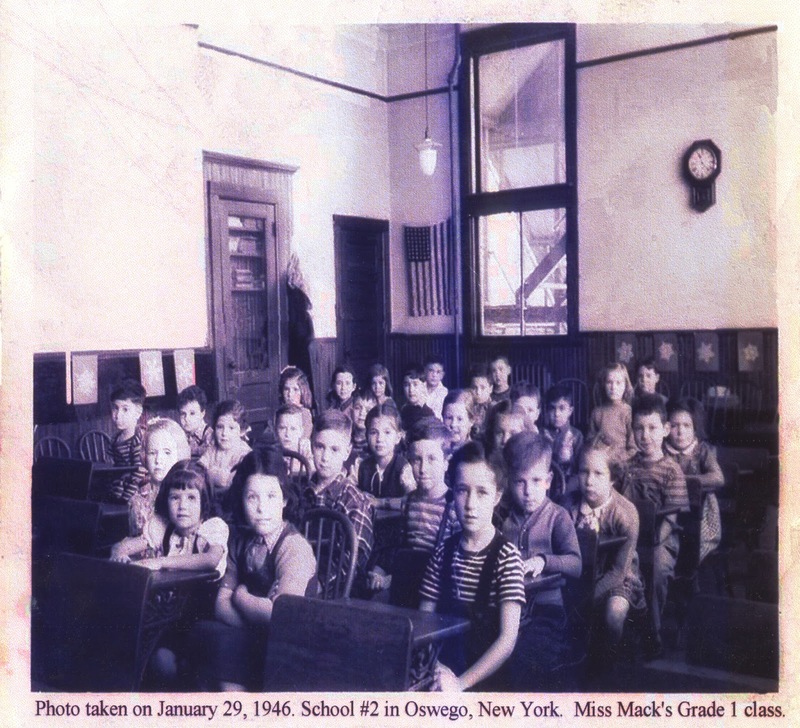 Oswego County's bicentennial celebration continues this weekend with the Oswego Players' production, "Dawn of Freedom." The show tells the story of a local "safe haven" for refugees during one of the darkest hours in world history. As the German Nazi regime swept across Europe during World War II, millions of lives were destroyed. Then, as now, many countries were hesitant to take in refugees. U.S. President Franklin D. Roosevelt finally agreed to accept 1,000 people outside regular immigration quotas. As "guests" of the president, they would not be permitted to stay in America beyond the war and were required to sign a statement that they would return to their home country at that time. To many; however, that condition didn't matter if it meant their escape from war-torn Europe and nearly 3,000 people applied for the opportunity. 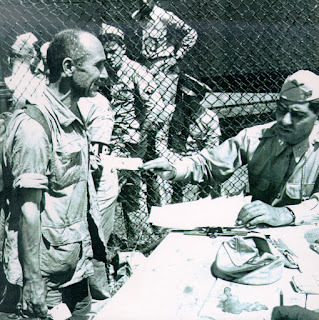 The grueling selection process considered those who had escaped concentration camps and whose skills would aid in running a shelter in America. Priority was also given to full family units and those who had relatives already living in the U.S.
U.S. Navy photo of USS Henry Gibbons. Image courtesy of NavSource Naval History. Finally, in July 1944, 982 men, women and children boarded the USS Henry Gibbons in Naples, Italy, bound for America. 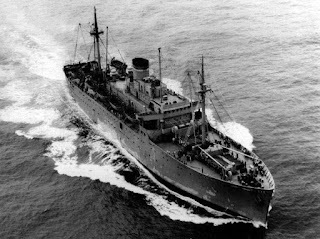 The troop transport ship was carrying injured U.S. soldiers and protected on both sides by ships holding German POWs. An additional 18 people who were chosen did not embark on the ship and their whereabouts were, and remain, unknown. The rigorous two-week journey across the ocean was fraught with seasickness, extreme heat, and cramped space. When, at last, they arrived in the New York harbor, the group was elated at the sight of the ultimate promise of freedom: the Statue of Liberty. 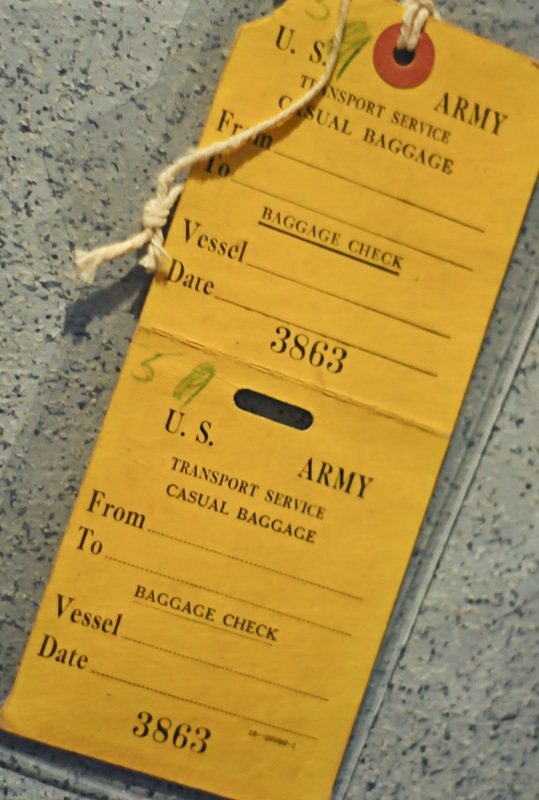 "Casual Baggage" claim ticket issued to refugees for identification. Image courtesy of the Safe Haven Holocaust Refugee Shelter Museum. 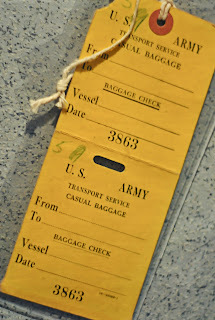 The refugees were each tagged with a "casual baggage" ticket for identification purposes and taken to New Jersey where they would board a train to Oswego. The sight of the train raised an alarm throughout the group as many of them had been taken to a concentration camp this way. After much reassurance, the group was finally persuaded to embark. 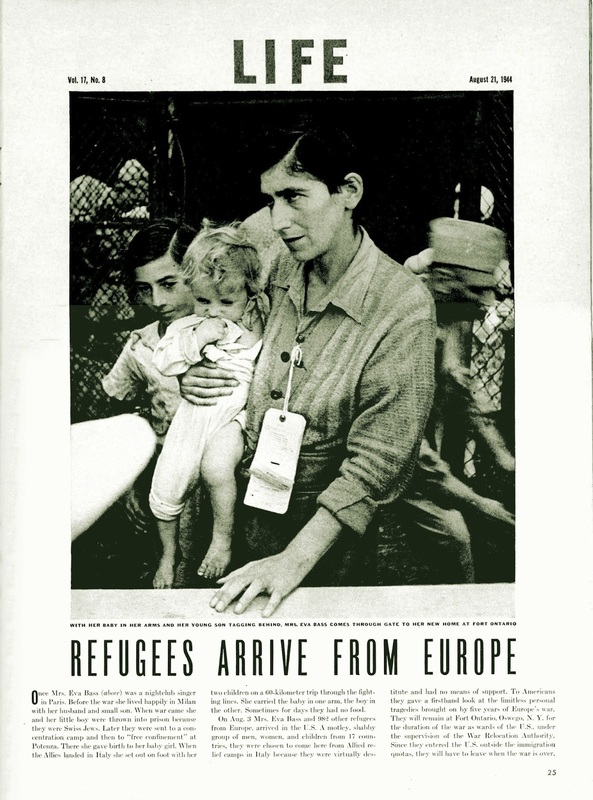 LIFE Magazine (Aug. 21, 1944) article describing the refugees arrival. Image courtesy of Fort Ontario State Historic Site. Their fears were further fanned when they arrived at Fort Ontario in Oswego, N.Y. One of three locations considered for the shelter, the fort was chosen due to its ample space, solid infrastructure and support from a small crew that remained behind after the U.S. Army had vacated the base earlier in the year. As an active military station, the fort was surrounded with a chain-link fence topped with rows of barbed wire for security purposes. This only reminded the refugees of the horrors of concentration camps. They feared that they'd been tricked into another one and refused to leave the train. The arrival of the refugees. After much persuasion, one refugee was convinced to enter base and assess this new situation. After careful inspection, he returned to the train and reported that it was not another concentration camp and told of the tables and tables of food that had been laid out in anticipation of the group's arrival. 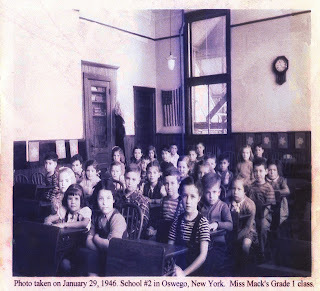 Children from the shelter attend local schools. 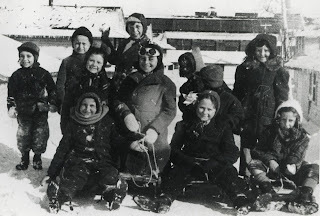 Children from the shelter enjoy Oswego's famous winter snow. Teens from the shelter spend time together. The refugees were quarantined for 30 days after their August arrival, so local family and townspeople came to the fence to greet and talk with them. 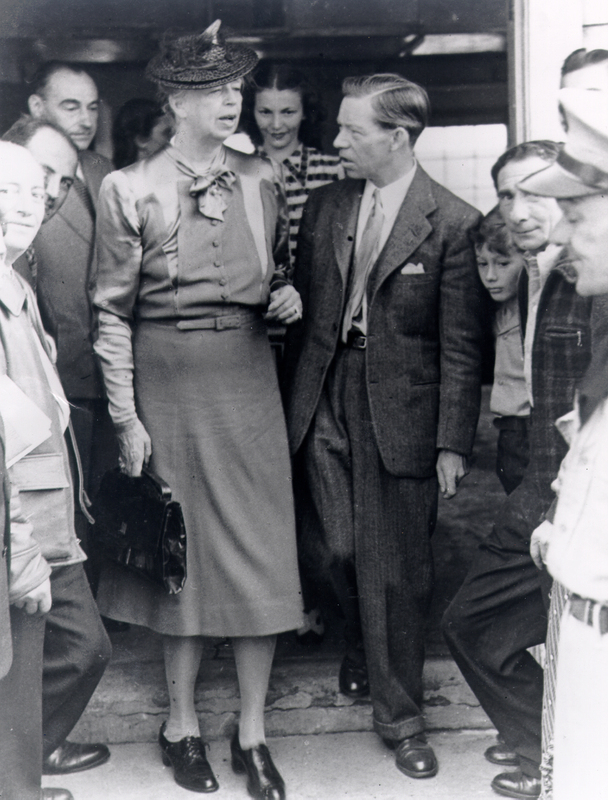 In September, First Lady Eleanor Roosevelt paid a well-publicized visit the shelter. Later, a public open house was held and day passes were given to the refugees. Children attended local schools and adults were assigned jobs at the base. They all received English speaking lessons and preserved their own culture with art, music and theatre classes, concerts and productions. They mingled with the local community by attending dinners and hosting dances. First Lady Eleanor Roosevelt tours the shelter with site director Joseph Smart. With the death of President Roosevelt in April 1945, the refugees' future became more uncertain. Many wished to remain in the U.S., despite having signed a document agreeing to return to their home country after the war. Later that year, with the Allies' victory secured, the U.S. Congress ruled that they must return to Europe after the December holidays. President Harry S. Truman; however, decided that it would be inhumane to sent them back to Europe knowing its condition after the war. On December 22, he signed an order allowing them to remain in the country if they so chose. While some people did return to Europe, the majority were bused to Canada where they received their visas to re-enter the country as immigrants and apply for U.S. citizenship. The Safe Haven Holocaust Refugee Shelter Museum. Image courtesy of Mary Ellen Barbeau. 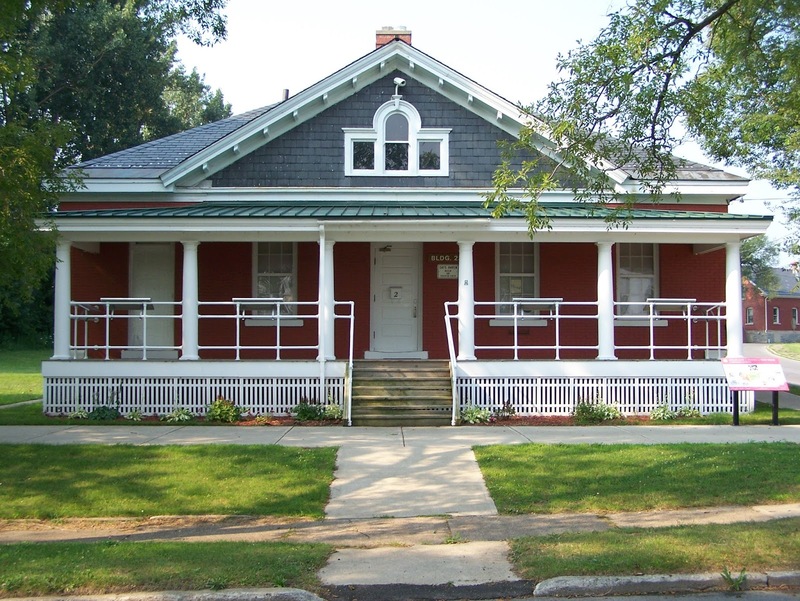 The Fort Ontario Refugee Shelter in Oswego, N.Y. was the only site in the U.S. that sheltered refugees of the Nazi Holocaust during World War II. 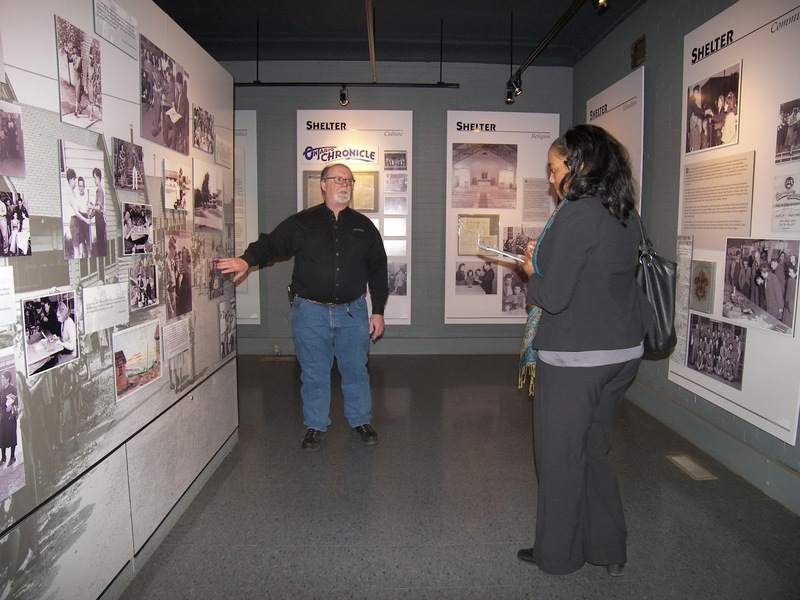 The Safe Haven Holocaust Refugee Shelter Museum is located in the shelter's former administration building to preserve their stories. 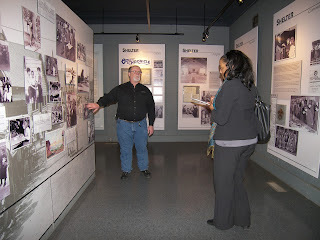 Bob Davidson answers questions about the shelter exhibit. Historian George DeMass describes the original site of the shelter. Come to the Francis Marion Brown Theater at the Fort Ontario Park Complex on East Fourth Street in Oswego, N.Y. to hear some of the refugees' personal accounts with the production, "Dawn of Freedom." Written and directed by Richard Sivers, the show is a living history of what life was like in the shelter. Through the words of 10 refugees, experience their joy and sadness and learn how their lives have impacted ours today. back row: Jeffrey Cole, Marianne Natoli, and Ken Snow. Image courtesy of Richard Sivers. Presented by the Oswego Players and the Safe Haven Holocaust Refugee Shelter Museum, the show begins at 8 p.m. on Saturday, October 8 and 2 p.m. on Sunday, October 9. Admission is $12 for adults and $8 for students and seniors. Proceeds will benefit the museum. For tickets, call the theater box office at 315/343-5138. 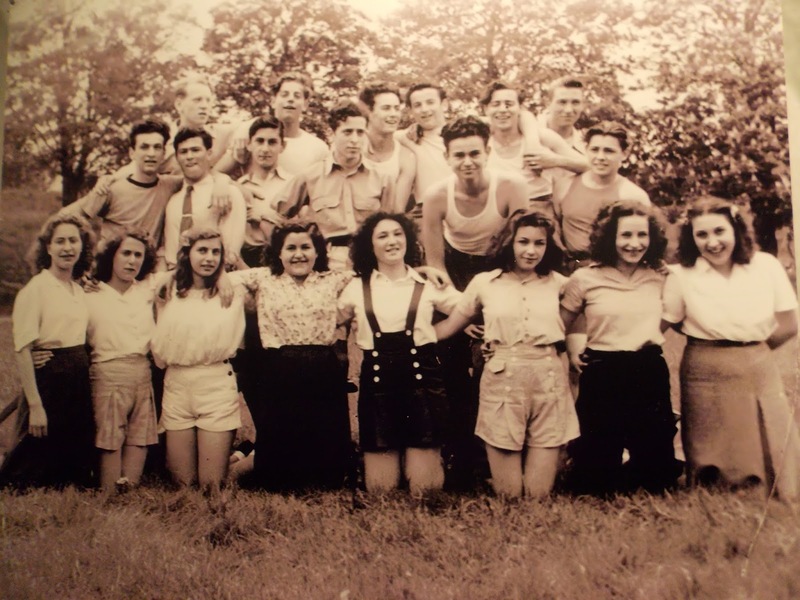 To learn more about this chapter in local history, visit the Safe Haven Holocaust Refugee Shelter Museum, 2 East 7th Street, Oswego, N.Y. 13126. It is open from 11 a.m. to 4 p.m., Thursday through Sunday, from Labor Day to Memorial Day. Summer hours are 11 a.m. to 4 p.m. daily. Admission is $5 for adults and $3 for children and students. 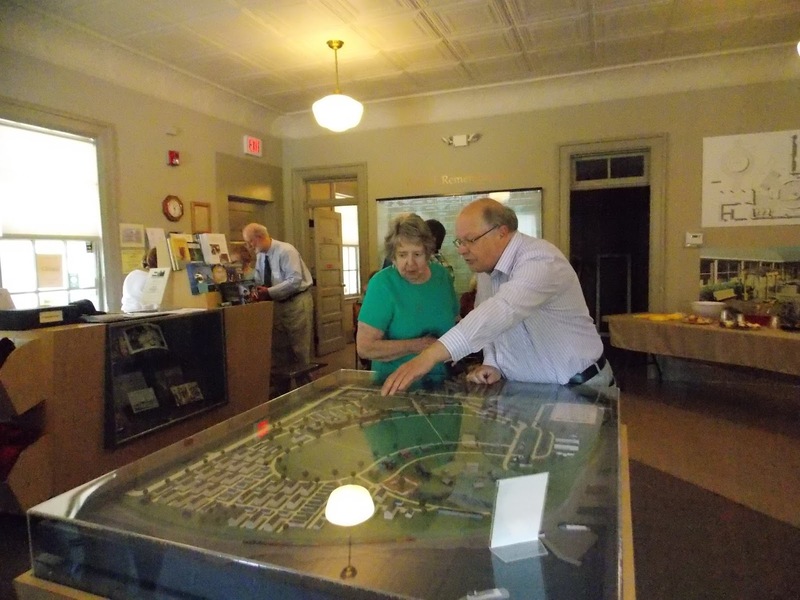 To schedule a group tour, call 315/342-3003.